Harar is a historic old city in the Eastern part of Ethiopia which was founded in 1520 by Sultan Abu Baker Mohammed. It is considered the fourth holiest city in Islam after Mecca, Medina and Jerusalem. The city has ninety-nine mosques, which is considered the highest concentration of Mosques in the world. Among the things for which the city has a reputation are the excellent handicraft skills which produce superb woven textiles, basket ware and silverware. It is a centre of Islamic learning and reputed for its superbly bound books. The city also has a well-deserved reputation for turmoil and bloodshed. Ahmed Gragn, who would later gain notoriety by almost destroying Christianity in Ethiopia, started his military rise by first killing Sultan Abu Baker Mohammed of Harar. He launched an almost successful Jihad against the Christian Empire in 1528 and almost achieved the destruction of Ethiopian Christendom. He would finally be killed by Emperor Galawdewos near lake Tana in 1543. Galawdewos would himself later be killed when trying to subdue Harar, and his head was paraded around the city on a stake. In 1647 control of the city was taken over by Emir Ali ibn Daud and the city grew as an important trading point, and as a centre of Muslim scholarship. Fighting with the surrounding Oromo tribes also continued. In 1875, Harar was occupied by Egypt after almost 250 years of autonomous existence. Their killing of the Emir led to a protracted resistance and their rule ended in 1885 with Emir Abdullahi in control. Soon after, in 1887, Harar lost autonomy to Menelik, the prince of Shoa. Menelik had understood the threat of the colonial powers, and was doing his utmost to save the independence of the region by fighting the warring dukes in the north and by forestalling the colonial powers in every direction. Menelik established a new administration in Harar which included several members of the Emir's family and was headed by his cousin, Ras Mekonnen -the father of Haile-Selassie. 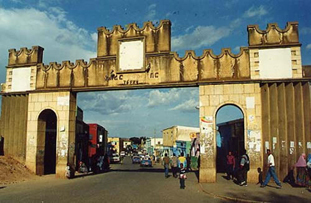 Harar lost its position as a trading centre in the early twentieth century when the railway line was opened linking Djibouti and Addis Ababa. Harar still remains important as the spiritual city of Ethiopian Muslims, and was made a federal city-state in 1995. One of Harrar's main attractions is the hyena man who feeds hyenas on the outskirts of the town every night. 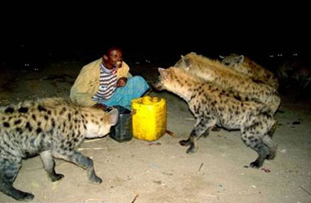 As evening falls, local men attract wild hyenas to the city in a bizarre spectacle as they bravely feed these dangerous scavengers.